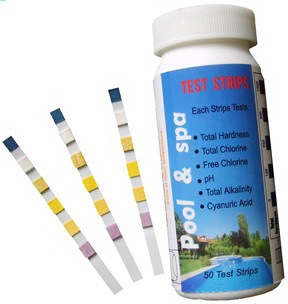 Swimming pool test strips are gaining popularity over the older drop or liquid pool testing kits. But which one should you use? Test strips or traditional drop / liquid pool water test kits? In this article, we’ll look at the pros of cons of both these pool test kits. Since strips are so easy to use, more and more people today are using them. They are suitable for regular testing of your pool’s water. Pool test strips are accurate but the accuracy depends on a few factors. Some pool experts say that strips can be more accurate than drop kits because with drop and liquid testing kits, there’s much more room to make errors. You only need to add one extra drop of liquid and your test will be inaccurate. They’re dead simple to use. Simply take a strip and dip it in your pool water for 5 seconds. Take it out and wait 10-15 seconds until the colours appear on the strip. Compare the colours to the chart that comes on the package. This will give you the levels of each chemical. Most strips test between 3 and 6 different things at once. Require very little technique to use – simply dip in water for 10 seconds then compare colours with chart on instructions. Can get contaminated – avoid by not touching pads and keeping them sealed. This is the traditional way of home testing your swimming pool water’s chemical level. Testing involves taking a sample of pool water, adding a set amount of the special drops that come with the kit to the sample. The water sample will then change colours. It’s then a matter of comparing the colour of the water sample to a colour chart. You will need to repeat these steps for each chemical that you’re testing for. Liquid Kits Vs Strips Tests – Which to Use? They both have their place. And they both do a similar job. Some people find liquid test kits more accurate. You should be testing your pool water a minimum of 2-3 times per week. So based on that, I would personally recommend strips because it means you’re much more likely to test your water more often, since they’re so easy to use.